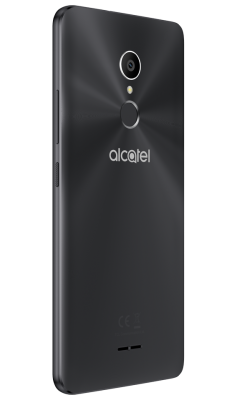 The Alcatel 3C is part of Alcatel’s new 2018 product portfolio and offers a great multimedia experience for its users. This phone comes with a big display allowing you to comfortably watch your favourite films and TV shows. The Alcatel FullView 18:9 screen allows for a 6.0” in the size of a 5.5” phone so the phone is compact and easy to hold. It is the perfect device for streaming TV shows and films, as well as gaming, so the Alcatel 3C is ideal if you are looking for a portable multimedia and multi-purpose phone. The 18:9 new screen is fantastic as users can see the whole picture without scrolling. This means you can browse more and scroll less as the new display shows more content all at once. Another brilliant feature of the Alcatel 3C is the fingerprint sensor. This allows for instant unlock and secured access and means you can keep your data private and secure as only your print can unlock the phone. In addition to this different fingerprints can launch different apps directly from the locked home screen. Selfies can also be taken with one tap via the fingerprint scanner. New to the Alcatel 3C is the new “Social Mode” in camera settings, which offers instant previews and quick share. You can take, edit and share pictures instantaneously so you can share your joyous moments instantly. The Alcatel looks very stylish and comes in three different colours: Metallic Black, Metallic Blue and Metallic Gold. The radial detailing provides a sophisticated shine and the rounded shape and slim design look fabulous. This phone is a dual SIM smartphone and has 16GB ROM Internal memory + 1GB Ram, so it supports a microSD card while also having a big battery life of up to 15hrs talk time. The Alcatel 3C is ideal if you are looking for a portable multimedia and multi-purpose phone. It is available from Asda and the RRP is £104.99. Accessories also available are a translucent shell, a soft case and a screen protector.